Discussion in 'COMMERCIAL Announcements' started by Spip, May 20, 2016. Let me present to you Space Opera for U-he Diva. All presets have Velocity, Modwheel and Aftertouch extensively assigned. A ‘try before you buy’ sample of sounds is available to download. Saxer and givemenoughrope like this. These sound damn good to me! Sami, buying without listening based on your Serum pack... that was genius, I'm sure this is, too! Thank you so much for your kind words ! And thanks to all of you who already bought it. I am indeed more than happy and it goes straight to my heart to see that a lot of people who already bought my previous soundsets have bought this one less than 48h after its release ! 2. Following the guidelines learned with Camel Audio and finding it globally a good approach, I've set the levels of the presets to be -3dB or -2dB for the peaks (in Pro Tools). It seems too low for some people. I'm currently working to provide a second version of the presets, with the modwheel limited and the levels hotter. What do you think ? Are these a problem for you ? We talked about the modwheel via Email. I am fine after I know that I have to use the modwheel once in your path to have the correct loud settings in place. I've just finished a new version of these presets. They are added to the original presets. The new version (with a "+" at the end of the names) has the modwheel set by default to 0 instead of 64, the mid position. Of course, it reduces the sonic possibilities but you can play directly a loaded preset without touching your modwheel. These "+" presets also have their volume levels a little bit higher, to be on par with the factory library, just to avoid the annoyance of switching from a loud sound to a quiet one, and vice versa. The louder version being maybe more convenient, I think that with the digital systems we use these days, low levels are not really a problem. On the other hand, peaks beyond 0dB can be source of troubles. For those who have already bought this soundset, you should receive it shortly. If you are happy with the original version, just skip the updated version. To me, the original presets are better but you can install them both and choose yourself which one you prefer or even use both, if you want ! PS. I would like to say a big thank you to Thomey here for his help and the time he has spent testing these new versions. 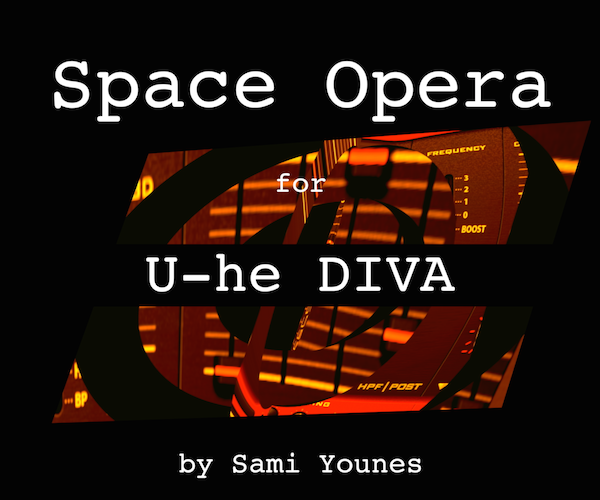 Sami's presets for Diva are great, the additional ones he developed are a great (free) expansion to the original Space Opera for u-he Diva patches. Video added to the first post. Last days for the Intro Price ! Sami - I can now confirm the sound bank is at least as good, if not better than the Serum set. 3 of the patches have already made their way into a project I just finished. They were exactly what I needed to fill out a bridge that still needed that something extra. SUMMER SALE ! 25% Off until August 31st.